Casey Schermick, the sports information director, talks about the latest week in Pioneer sports. 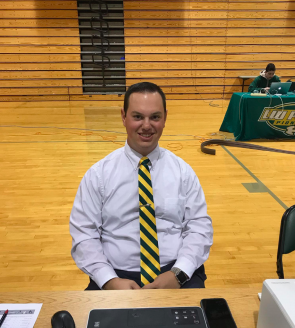 Schermick gives a recap for the fall sport season and the expectations for the next season after the One LIU merger, and also delves into the winter season with men’s basketball. This interview was originally done through the WCWP sports department and shortened for publication. Mattina: They (men’s soccer team) lost in the East Regional Final against Adelphi University on that snowstorm of a day. It really changed the tempo of that game. So, how does the men’s soccer team put this game in the past and look towards next season? Schermick: I think there is a lot of solid pieces that are gonna be coming back next year. I think it’s going to be interesting to see the dynamic, obviously with the combining of the two squads, between us and Brooklyn. Brooklyn had another very successful year this year, just like Post did. So, I think that is going to be a very strong program next year. It’s gonna do a lot to compete in the NEC (North East Conference). It’s gonna take a couple weeks to get over that loss, so, obviously it’s a tough way to end your season. But I think looking forward they’re definitely going to be excited for next year. Mattina: Graduate student, Lukas Ostermann added more to his postseason resume, earning the United Soccer Coaches First Team All-Region. This season he also earned the Division 2 CCA East Region Player of the Year, the Google Cloud Academic All-District team and Offensive Player of the Year in the East Coast Confer- ence. I think we can agree that Ostermann has definitely left a legacy here. Schermick: By the time we talk about this again, he’ll be an All-American for both Division 2 CCA and the United Soccer Coaches Association. It was one heck of a year for him. Obviously coming one goal away from the school record and finishing with 23 goals, second in the country, it was fun to watch him. Mattina: Four members of the women’s soccer team earned recognition on Monday, Oct. 26, when the United Soccer Coaches Association named them to the All East Region team. Senior Hillevi Eklow, junior Gabrielle Clark, and sophomore Samantha Gordon earned First Team Accolades, and junior Julia Duffey earned Second Team. Now three of these four will be returning next year; how important are these players to the team? Schermick: They’re gonna be very important. It’s great to have the recognition and the publicity for these programs. But, I think sometimes things get lost in translation when you go from so many awards that are voted on by SID’s compared to the coaches and I think you see that with the United Soccer Coaches Association. Four All Region players. Definitely some players that don’t show up in the stat sheets but are key members of this team, especially on the defensive end allowing less than a goal per game this year, I think it was outstanding. I think both Gabby and Sam were big reasons in front of Hillevi in goal, and obviously Hillevi in goal had another outstanding season. With the first team recognition, I think there is going to be some key pieces that they are going to look for coming next year to lead the Division 1 team. 18 All-NE10 Honorees. Head Coach, Bryan Collins, who got Coach of the Year, red-shirt senior Jake Carlock, won Defensive Player of the Year, Graduate student, Kevin Petit-Frere, won Defensive Lineman of the Year, Red-Shirt senior, Chris Coles, won Offensive Lineman of the Year, and 18 other players won All-NE10 Honorees. Just talk a little bit about the team and all 18 All-NE10 Honorees. Schermick: Well, I think just looking at some of those major awards, it was a year that may have surprised some people for football, because if you look at recent years, the defense is the strength of this team. It was a shootout in some games where, you know, the offense was putting up 40 to 50 points a game, that’s how they were coming away with some wins. But, I mean this year was really the defense that carried them to that undefeated regular season and the conference title. I think it’s well deserved that Jake Carlock and Kevin Petit- Frere got the recognition that they definitely earned, and I think in about week six or seven, there were three or four options on the defense that you could have put up for Defensive Player of the Year this year and it’s a well deserved recognition. 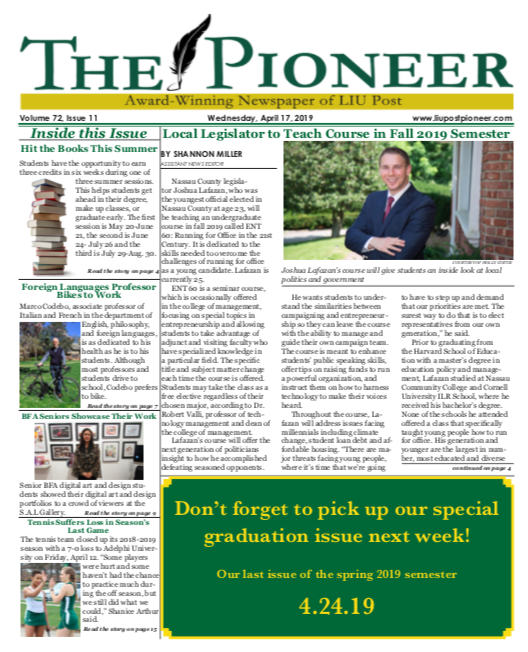 The rest of the All-NE10 Honorees can be found on liupostpioneers.com. Mattina: The men’s basketball regular season is underway, they have not played a conference game yet. They added a new player to the roster, the walk on red-shirt senior, Neil Feminella, from the men’s soccer team. Sophomore, Alonzo Ortiz-Traylor was named the ECC Defensive Player of the Week and freshman Kendell Ogilvie was named Rookie of the Week. For Ogilvie, he had a career high 20 points and seven rebounds against the College of Saint Rose, four to six in three pointers and four steals. With all these problems going on right now with the men’s basketball team (several players forfeited the season), these two guys have really been stepping up to the plate and playing their hearts out. What is it like to have a guy who has some experience from last year and a rookie making an impact like this already? Schermick: I think it’s exciting to see the leadership that Alonzo has shown especially on the floor this year, kind of trying to rally those freshman around him along with someone like Jackson Jordan (sophomore guard), who has also played very well early on this year. I think they’re still going through the feeling out process phase of trying to learn how to play with each other on the offensive end. I think they’re going to get better looks and start to create some easier buckets for them- selves and I think they are going to compete throughout the year. Obviously, it’s a difficult time and it’s an unfortunate situation but I definitely think it’s exciting to see someone like Alonzo put that leadership out there. It’s definitely something that stands out in the department.